Martin Corbett (aka dr trippy) first started playing electronic instruments at the tender age of 14 when he built his own analogue synthesiser. This turned out to be a more-or-less unusable musical instrument and it was to be another 10 years before he got his hands on a ‘proper’ synth – a monophonic Korg MS10. 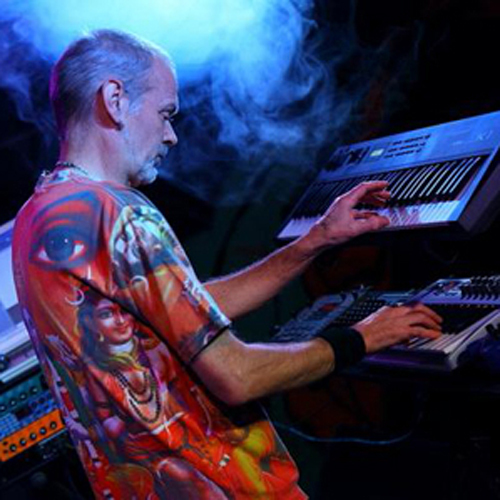 As a member of the Bath-based band Demented Stoats, Martin took the Korg to its first festival (Stonehenge Free Festival) and played regularly with the Stoats until they disbanded. Two of the band went on to join Hawkwind whilst Martin sought out the relative quiet of electronic music composition in the cellar of a flat in Manchester. As his synthesiser collection grew it became clear that he couldn’t play them all at the same time and so he tentatively entered the machine world of digital sequencing. During the 1990s, Martin slowly entered the computer age and added digital sampling to his musical armoury. It took a couple of brief sojourns to Goa before everything fell into place and the distinctive dr trippy sound was born. Combining Indian vocals, the rhythms and resonance of dub reggae and a battery of synthesisers and effect units, the dr trippy sound caught the attention of Toby Marks (Banco de Gaia) who persuaded him to play his music outside of a cellar. With a couple of Banco support slots in Camden and Birmingham, dr trippy’s music finally reached an audience and performances at festivals -including Glastonbury, Bearded Theory and Beautiful Days – were soon to follow.